Metropole’s 360° Camera System captures the complete view of a space in one shot. The 360° Camera System is comprised of the latest digital camera technology from Nikon* and a patented lens that reflects an entire 360° field of view in a curved mirror. With one photo, a user captures a 360° circular image. Processing the digital photo is easy; in seconds, user-friendly software translates the circular image into a 360° immersive image that is Web and e-mail ready. If you can click a camera, you can use the Metropole system. Metropole provides you with everything you need. 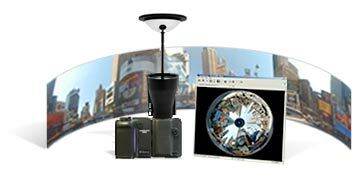 Within minutes you can snap, click and post the 360° picture to your Website, online Brochure or e-mail newsletter. * We recommend Nikon products with the OneShot360 for the best 360° photos. However you can use other compatible cameras, to see complete listings click on Support.